[OCT. 3, 2002] In the Looking for Lincoln video none of the actors has a speaking part. Instead, narration by six local commentators and one professional will be dubbed in. Of the locals, Paul Beaver tells the christening story and Paul Gleason narrates several legal cases. Ron Keller, director of the Lincoln College Museum, describes relevant artifacts in the museum collection. Beaver said he had trouble sounding natural while following the script. Eventually, he, Gleason and Keller all discarded the prepared words and "became teachers again," telling the events in their own words. The script was well-written, Beaver said, but it did not sound like them. 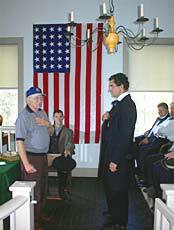 Richard Schachtsiek, site director at Postville Courthouse State Historic Site, narrates the story of the nickname Honest Abe. Susan Hoblit, descendant of Lincoln’s friend John Hoblit, tells about Lincoln’s stay at the carriage house in Atlanta. Finally, Gillette Ransom relates stories about her great-grandfather John D. Gillett. The professional narrator, who will tie the elements of the video together, has not yet been chosen. The final scene shows longtime Lincoln portrayer Charles Ott at the site of the Lincoln christening welcoming visitors to Logan County. 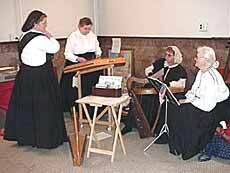 In addition to narration the sound track will also feature period music. For possible inclusion, cinematographer Dean Williams has several CDs of music by the Prairie Aires, an area band whose instrumentation includes lap and hammered dulcimers, recorders, harp, cello, chimes and bodhran. Besides the action footage, the director has still photos of three relevant paintings and a poster. The paintings are Billy Morrow Jackson’s young Lincoln from the Lincoln College Museum collection, Lloyd Ostendorf’s town christening painting from the State Bank Annex and an oil of John Dean Gillett from his second home, on Elkhart Hill. The poster, also in the LC Museum collection, lists the stops of the Lincoln funeral train from Washington to Springfield. Williams has much more footage than can be included in an 18-minute video, so the task of cutting and splicing will be daunting. Mike Unland is charged with that responsibility. Also, Beaver, Ransom and Cindy McLaughlin have been told that they will be expected to help match footage with narration. McLaughlin, executive director of Main Street Lincoln, was active in coordinating the project. Williams has expressed interest in putting together a "making of" documentary on the Lincoln video project. Scenes which do not fit in the tourism video can find a home there. These include shots of Abe and Mary Todd Lincoln checking into the Holiday Inn Express and using the hot tub, taken to thank the hotel for its service. During the filming the actors often ad-libbed so characters seem to be speaking. Some of their quips might be included. For example, at the Mount Pulaski Courthouse Woodard as Lincoln said to the witness, "I have one question and one question only for you: Is it briefs or boxers?" One of the most dramatic scenes to occur during the shooting will end up among the outtakes. 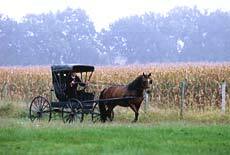 In the background for the city of Lincoln christening scene was a farm wagon drawn by a pair of mules. Williams staffer Fran Byers had donned period costume to drive the mules. However, something spooked them and they took off, breaking their harness in the process. The mules ran for a quarter of a mile through the pasture before being stopped in true Hollywood fashion by members of the Illinois 7th Cavalry, who grabbed the harness and saved Byers. She was shaken up but not injured. 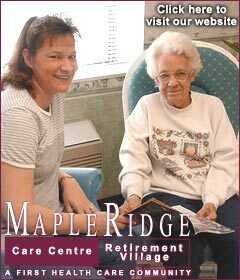 Your pathway to lifelong learning! 7:00-9:00 pm, 10/8, U of I Ext. Which Horse Is Best for You? 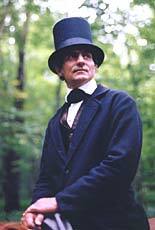 [OCT. 2, 2002] Scenes in the Looking for Lincoln video represent documented activities of Abraham Lincoln in Logan County and take place at either authentic sites or accessible sites that retain the feel of the mid-1800s. In one scene Lincoln rides on horseback over Elkhart Hill, following the old Edward’s Trace. The route was part of the 8th Judicial Circuit that Lincoln traveled. Another scene takes place on the Hoblit farm south of Atlanta. Lincoln stayed overnight at the carriage house there, and the building still stands, now used as a shed. Lincoln appears with his friend John Hoblit, played by his great-great-great-grandson Frank Hoblit. Also authentic is the John D. Gillett house at Cornland. Lincoln drove himself there to invite Gillett to his inauguration in Washington, D.C., as a member of the president’s honorary bodyguard. Gillette Ransom, a descendant whose name was given the final "e" to make it more feminine, said she possesses a list handwritten by one of Gillett’s daughters of men invited to take part in the honor guard. In the video John D. Gillett is played by Lee Johnson, whose family has farmed for Gillett’s descendants for generations. The scene also includes young actors portraying Gillett’s six children. The second-floor courtroom of the Mount Pulaski Courthouse was the scene of two notable legal cases Lincoln took part in: the case of the cast-iron tombstone and the horological cradle (a supposed perpetual motion machine). There is "no place more authentic than this," Beaver said of the Mount Pulaski courtroom, adding that most items there, if not the real thing, are close enough to give the effect. From the volunteers who showed up in period dress, Paul Beaver selected men to play the judge, prosecuting attorney, secretary, witness and jury. No women would have been inside the bar except for witnesses, he explained. And in the cast-iron tombstone case there are no recorded female witnesses. However, women accompanied men to trials, so both sexes occupy the public benches in the taped scene. The Middletown Stagecoach Inn is an authentic building, although it has been moved from its original site. Abe and Mary Todd Lincoln, played by Joe Woodard and Gillette Ransom, are shown arriving there by stage and being ushered in by the innkeeper, represented by Ed Busch of Lincoln. Other exterior scenes occur in front of the Knapp Library and Museum in Middletown and in the town park, where Lincoln shoots marbles with local boys. The original scene took place in Postville Park. In another shot Lincoln socializes outside Postville Courthouse while narrator Richard Schachtsiek tells of the legal case tried at Postville in which Judge Treach called the future president "Honest Abe." Unfortunately, Lincoln’s client had lied to him, and he was later embarrassed by the case. Lincoln worked as a surveyor in Logan County. Video scenes show him surveying for the town of Albany and for Musick’s Ferry on Salt Creek north of Middletown. Both scenes were filmed at the Paulus-Conrady farm. Beaver said the committee chose the farm because it provides one of the few pastures open enough to accommodate filming apparatus and containing a creek and long-established trees. The surveying party rides on horseback. Members of the Illinois 7th Cavalry re-enactment team participated and provided their own civilian clothing, tack and three horses. The party also included a Native American flagholder, played by Kent Vincent of Springfield. A woodsman, Vincent teaches Indian lore and outdoorsmanship to Boy Scouts. Though the original flagholder was a Kickapoo, Vincent is an Oneida and as such is not a horseman. As a result he was uncomfortable making the scene in which the party fords the creek. His discomfort was intensified by the fact that his pinto usually works with a martingale, which has no bit. Fitted out with a bit for authenticity, she was visibly uneasy and tried to reject it. The scene of Lincoln christening his namesake city was also shot at the Paulus-Conrady farm. Beaver said Wayne and Lois Conrady and Wilbur Paulus came out to watch and help. They provided railroad ties needed for props. Lee Johnson as Gillett, Ron Keller as Robert B. Latham and Daris Knauer as Virgil Hickox participated in the scene in addition to many others. Beaver said the Lincoln christening and several other scenes occurred in or near September, so the filming date is appropriate. 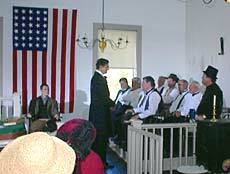 [OCT. 1, 2002] On Thursday, Sept. 26, about 35 people in mid-1800s garb and a dozen or so crew members gathered at Mount Pulaski Courthouse for the final day of shooting the Looking for Lincoln video of Abraham Lincoln’s activities in Logan County. The video, which will be used to promote tourism, has been over two years in the planning stages as promoters first sought and then awaited funds from an Illinois legislature Member’s Initiative grant. When the check arrived, it took only two weeks for shooting to begin, thanks to prior selection of sites, key actors and cinematographer Dean Williams of Springfield to direct the film. Williams brought an impressive resume. 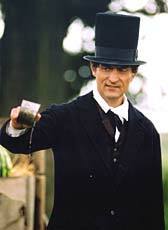 His website, deanwilliams.net, lists 38 movie credits and 48 TV credits, including "Abraham and Mary Todd Lincoln" on PBS. The script by Dawn Edwards of Springfield was also virtually complete, needing only final touches to make it fit the voices of the narrators. Gillette Ransom of Elkhart said the video project brought together many elements of the community. These included individual volunteers and groups interested in history and tourism. She praised Rick Unsbee as an outstanding videographer. Logan County Looking for Lincoln chair Paul Beaver acted as both producer and historical consultant for the video. When former Illinois Sen. Bob Madigan agreed to support the grant application, he secured Beaver’s promise to take responsibility for the film’s historical accuracy. Beaver’s area of responsibility included seeing that costumes and props looked authentic. Many participants, among them volunteers from New Salem Village, wore their own costumes. Other clothing was obtained by Ransom. "Are all costumes going to be 100 percent?" Beaver asked. "No. We don’t have that kind of money." But he took care that the look was authentic. One example was removing hats from jury members in the court scene but allowing spectators to wear them. Props included various types of wheeled vehicles and even a building. Landon Vannoy of Atlanta supplied a buggy, and the Joe Hinkle family of New Holland provided a two-seat doctor’s buggy for the Cornland scene. Irwin Conklen brought a wagon, and Don Leonard of Mount Pulaski supplied a stagecoach for the Lincolns to alight from. On the largest scale, the Railsplitter Association allowed its small wooden building, formerly used as the festival office, to be moved from the area by the horse barns at the Logan County Fairgrounds. Beaver selected the building as the closest thing available to what the temporary building constructed by the railroad in 1853 must have looked like. Gillette Ransom secured most of the horses for the video. They included Royal M. Cody, a "magnificent Morgan horse" who will also star in a film to be shot at the Lincoln Home in Springfield this November. Carolyn and Kathy Firch of Rocking Horse Morgans in Springfield own the animal. Outstanding among the actors, Joe Woodard of Villa Grove, near Effingham, played the crucial role of the young, unbearded Abraham Lincoln. "He’s made the movie," Beaver said. "He looks so much like Lincoln and has so much presence." Woodard won an Abe Lincoln look-alike contest at the Elkhart Chautauqua. A clerk at Holiday Inn Express in Lincoln exclaimed when she saw him in costume, "Oh my God, you do look like him!" The hotel provided Woodard with a free room and also offered their coffee shop when an on-location picnic was rained out. These are two examples of the generosity and kindness the crew said they experienced throughout the county. Beaver praised Irwin Conklen and his son for stopping their farm work to bring a wagon and Jim Britsch for welding a tongue onto the wooden Railsplitter building so it could be hauled to the site. "Nobody has said no," Beaver affirmed. The crew and cast even received some free lunches.